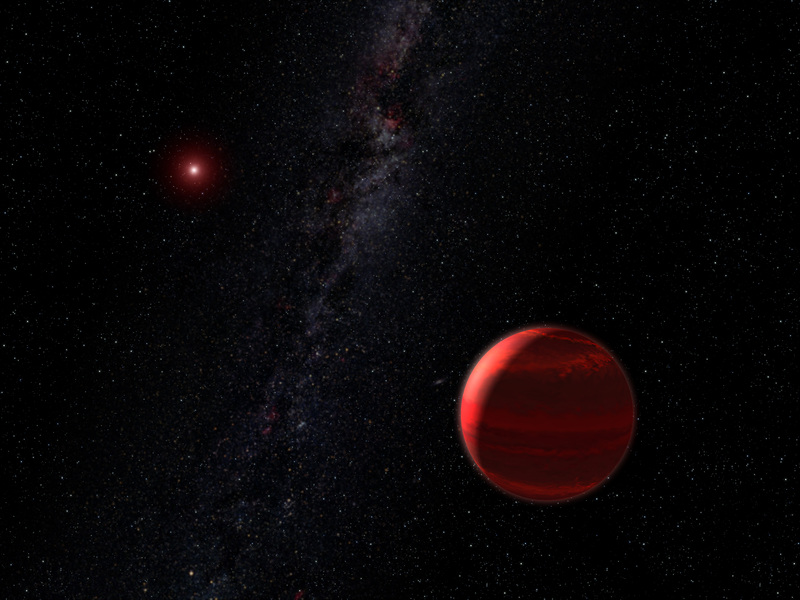 This is an artist's concept of the red dwarf star CHRX 73 (upper left) and its companion CHRX 73 B in the foreground (lower right) weighing in at 12 Jupiter masses. CHRX 73 B is one of the smallest companion objects ever seen around a normal star beyond our Sun. Estimated to be 12 times the mass of Jupiter, the object is small enough to be a planet, but also large enough to be a brown dwarf, a failed star. The NASA/ESA Hubble Space Telescope discovery of this diminutive companion to a low-mass star is a dramatic reminder that astronomers do not have a consensus in deciding which objects orbiting other stars are truly planets. The brown dwarf orbits 30 billion kilometres from its star (roughly 200 times farther than Earth is from the Sun). The youthful, 2-million-year-old star is one-third the mass of our Sun and lies approximately 500 light-years away in the Chamaeleon I star-forming region in our Galaxy.